CDC Austenson is a 2 row hulled feed barley with top grain yield and short, strong straw. CDC Austenson produces grain yields higher than Xena, along with high test weight and large, plump kernels. 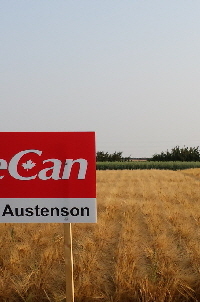 CDC Austenson is well adapted across Western Canada and compared to Xena, has shown improved resistance to prevalent races of net form net blotch, spot form net blotch and spot blotch. Custom application of seed protectants available. 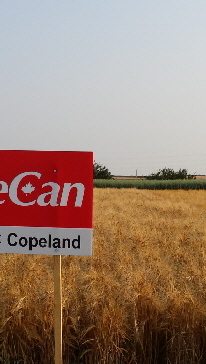 AAC Synergy sets a new yield standard for 2-row malt barley in Western Canada. A favourable quality profile that includes relatively low protein with high plump, high extract and low beta-glucan levels, complementing a good foliar disease package. AAC Synergy combines great yield potential with favourable quality for the malt market. “Recommended” status from the Canadian Malting Barley Technical Centre. Moderate resistance to net blotch and better stem rust resistance. Much stronger straw with a high test weight and plump kernels. Custom application of seed protectants available.